Punter Joe Schopper watches as his team fails to convert a fourth down play in the waning minutes of Saturday's loss. 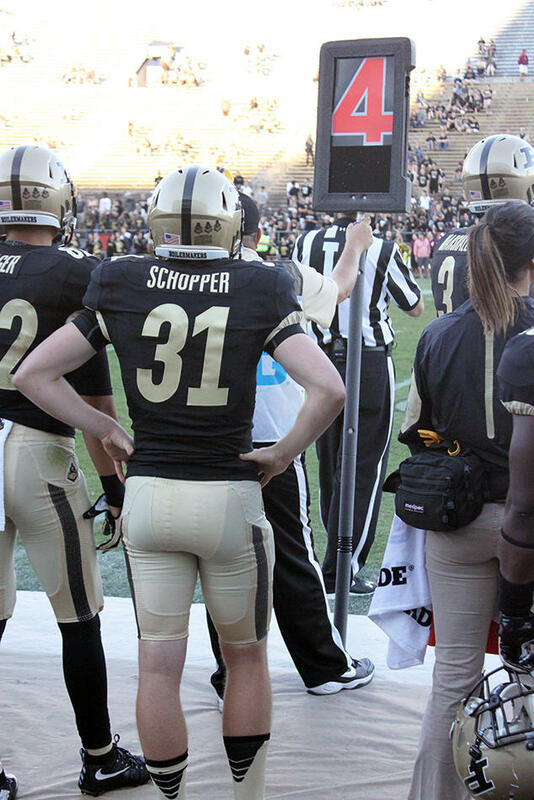 Freshman punter Joe Schopper had been the brightest Purdue light all day, repeatedly getting his team's lackluster offense out of tight spots with good kicks. He'd nailed a 69-yarder into a stiff breeze that pinned Virginia Tech inside its own 5-yard line. He'd averaged almost 50 yards per boot -- a third better than veteran Thomas Meadows, whose job he's now stolen. And yet, when the bad snap drifted off to Schopper's right with a minute to go in the third quarter, there was an air of inevitability. Schopper caught the errant ball, but by then it was too late. Against a team long known for feasting on special teams mistakes, his kick went only a couple feet before it was blocked by the Hokies' Terrell Edmunds and recovered by Anthony Shegog, who galloped into the end zone untouched. That put the visitors up 41-17, and not even an attempt at an inspirational speech from former coach Joe Tiller between the third and fourth quarters could turn the tide. Tiller and members of his 2000 Big Ten championship team were celebrated at halftime, but could not have liked what they saw. The Boiler defense repeatedly missed tackles in the backfield, turning what should have been losses into drive-sustaining gains for the Hokies. Starting quarterback Austin Appleby completed just nine of his 28 passes on the day and again was responsible for costly turnovers. His first quarter fumble was returned by Tech's Chuck Clark for a touchdown. An interception on an ill-advised long pass as the Boilers were driving in the third quarter stalled what had been the team's most promising drive of the half to that point. The junior continued his worrisome trend of staring down receivers, leading to a fourth quarter pick by linebacker Sean Huelskamp, who looked more like the intended receiver on the play than any Purdue player. 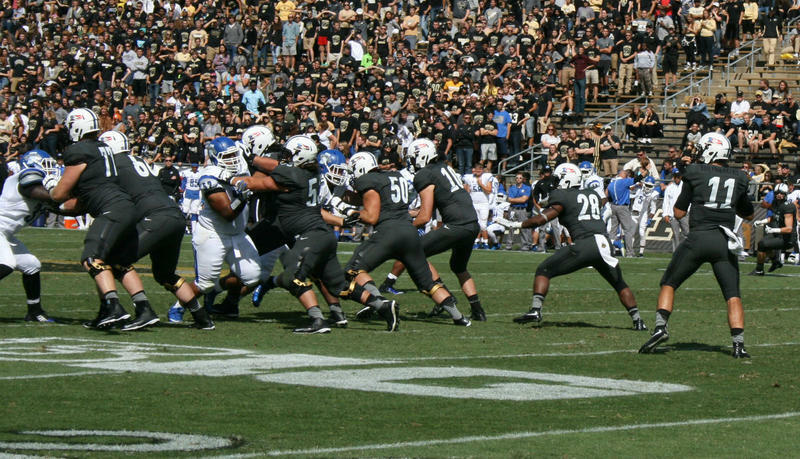 And with the team trailing 44-17 with 10:00 to go in the fourth quarter, Appleby was forced to dive on his own fumble on 4th-and-2 at the Purdue 35-yard line to prevent further damage by the Tech defense. He was eventually replaced by David Blough with eight minutes to go in the game. It wasn't as if Virginia Tech didn't make its share of mistakes. The Hokies were penalized 11 times for 87 yards. They also fumbled four times, but recovered three of them. The only one they couldn't corral was scooped up by the Boilers' Danny Ezechukwu, who rambled 90 yards in the opposite direction for a score -- tying for the second-longest fumble recovery run in team history. But the offense which had looked so promising the week before against Indiana State was stalled repeatedly by the much stouter Hokie defense. The oft-used read-option rushing plan was stopped for short gains time and again as Appleby and D.J. Knox combined to carry the ball 21 times for just 27 yards. As he has all season, freshman Markell Jones looked like the team's best running option, but he was handed the ball just five times (averaging six yards per touch) with the game still in reach. However, against the Hokies' second-string defense, Jones made his case for more impact carries by ripping off a 60-yard TD run. Purdue falls to 1-2 on the season and plays another 1-2 team next week when Bowling Green comes to West Lafayette. The Falcons fell to Memphis 44-41 Saturday. Purdue’s provost is leaving the university to become the next president of Virginia Tech. The Virginia Tech Board of Visitors selected Tim Sands as the university’s next president at a meeting this afternoon. His start date on the Blacksburg, Virginia, campus is June 1st. Virginia Tech is a land-grant institution with a student enrollment of more than 31,000. Sands will replace current president Charles Steger, who will be stepping down after 14 years in the position. Purdue's football team put itself in a lot of holes last year -- both on the scoreboard and at the bank -- in part because the offense was rarely flashy or exciting to watch. Saturday offered a glimmer of hope that's changing. The Boilermakers jumped ahead early with a 75-yard scoring drive in the first two minutes, ending with a 57-yard touchdown pass from Austin Appleby to Cameron Posey. Later, Purdue would drive another quick 70 yards in six plays.